We sell Golden Blend Feed for goats, sheep and dogs. No, this is not our designer blend. It is the specialty blend of feed from Custom Milling in Davisboro, GA. They have been our feed source since we brought our first goats to Golden Acres. Our veterinarian came and inspected all the labels and said it had everything they need for proper nourishment, especially since Florida soil does not contain all the nutrients animals need. It is prepared based on the needs of the type of livestock. For example, sheep cannot have copper, while goats need it. Every bag has the same ingredients in the same percentages. This is especially important for the goats since we need to provide them with consistent amounts of minerals. And they have developed their blends using natural materials. We feed this as a supplement every morning, which also gives us the opportunity to inspect our sweet critters every day. 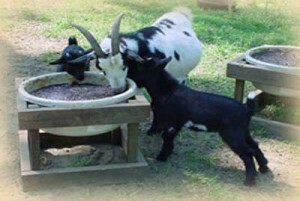 The goats in this photo are enjoying a natural mineral lick, which enhances their forage diet. We keep the feed and goat minerals in stock. Dog food is usually available and we can order products for alpaca, llama, horse and dairy livestock as needed. Deliveries come from Custom Milling every 4 weeks and all the products are kept in an air-conditioned, weather-proof room. Please Contact Us for prices and current inventory. 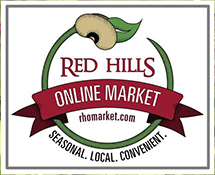 We can take payments by PayPal or credit card for your convenience. Custom Milling calls us to get our order every month and then they make the product to order. I particularly like the custom blend of minerals which are provided to our livestock as free choice. Our feed room is air conditioned which keeps the moisture to a minimum. Owner Scott personally delivers to us monthly and rotates and feed that is left so it is used first. They have readily answered questions posed to us over the years. We have had a 15 year relationship and always pleased. In addition, they supply us with Food Grade Diatomaceous Earth, more commonly known at DE. We use it for many things and we do have a following of folks that buy it on a regular basis. It controls fire ants, and many people us it for flea and roach control. Since is it not poisonous, it can be used safely in the house.